What do you do when pesky zoning regulations tamper with architectural creativity? If you're an architect like Djuric Tardio, you work with them to make the most eco-friendly and head turning house on the block! 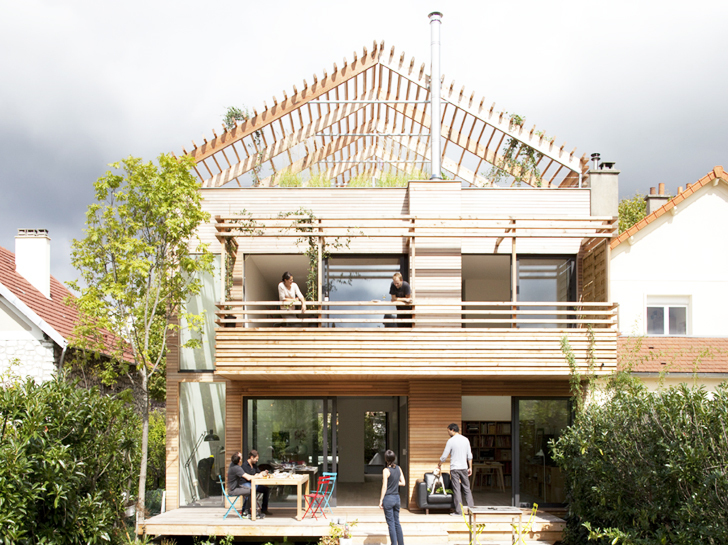 The French firm did just this in the suburb of Antony, Paris, with a stunning pre-fab family home created completely out of sustainably grown and managed Finnish larch. The house is stacked with flexible features, passive measures, and transitional spaces, creating numerous on-site possibilities that make outdoor zoning laws a tiny detail. Placed on a densely populated block, the two story house boasts a great deal of well-utilized outdoor space including an enormous roof terrace, a hanging balcony from the second floor and a decked dining area on the first. The roof’s unfinished look is intentional, with the overhead spaced beams not only providing selective shade and keeping the wood surface cool under the sun, but also aiding in the collection of rainwater. The roof also features a vegetable terrace that grows grass and vines of fruit such as kiwi and grapes for the family to enjoy their own snacks. Combined, the garden and slanted roof design also create a safety barrier, allowing the children to play on the great open surface. The back patio and south facade were designed deliberately oversized in order to work with the environment throughout the seasons to control the house’s climate. The wood surfaces catch and harness the sun’s rays to passively heat the house in the summer and remain covered in the winter as to insulate the home’s walls, saving loads of money on heating and air conditioning bills. Some of the house’s greatest features are the flexible and adaptable parts the can grow and adjust with daily or even long term needs. Giant sliding walls separate the main living spaces, allowing for a private library, living room, or theatre when needed. Conversely, the spaces can be opened up and combined to create large entertaining, work, or play areas throughout the various rooms. Sideboards also move between the kitchen and the terrace, positioning the dining area outside on nice warm days. The front facade of the home is incredibly unique in itself. Windows made of stainless steel mirror shutters not only ventilate the northernmost rooms, but also make the street-side wall of the house a reflective piece of art. Each mirror window captures the nearby trees and passing cars, creating an ever-changing face on the front of the house that also serves as a unique camouflage behind the trees. The most important aspect of the home’s sustainability is its construction. Completely prefabricated offsite and delivered to the block, the simple procedure greatly reduced the potential pollution and noise for the sleepy suburban neighborhood. Finnish larch is known for its super durable and waterproof qualities as well as its smooth and knot-free surface, making it one of the most sought after materials for yachts and other small boats. This particular wood was sourced from small private forests dedicated to sustainable management and responsible growth. The pre-cut larch panels for the outside of the house get even more green points for including wood fiber insulation and non-treated siding. This super combo not only helps with the passive heating and cooling of the home, but also gives the house a unique appearance as the wood changes throughout the years. I am very interested in this concept and would like to see a finished house. Beautiful....my compliments Djuric Tardio. Placed on a densely populated block, the two story house boasts a great deal of well-utilized outdoor space including an enormous roof terrace, a hanging balcony from the second floor and a decked dining area on the first. The roof's unfinished look is intentional, with the overhead spaced beams not only providing selective shade and keeping the wood surface cool under the sun, but also aiding in the collection of rain water. The roof also features a vegetable terrace that grows grasses and vines of fruit such as kiwi and grapes for the family to enjoy their own snacks. 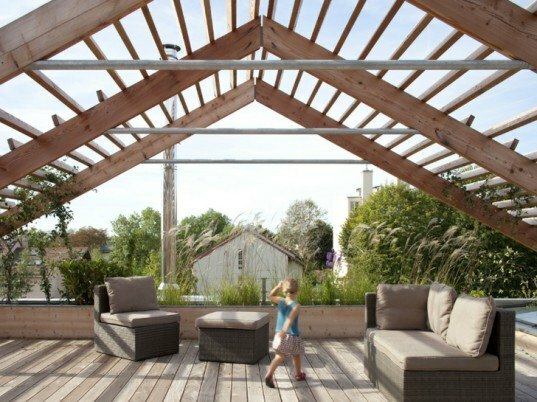 Combined, the garden and slanted roof design also create a safety barrier, allowing the children to play on the great open surface. The back patio and south facade in general are deliberately oversized in order to work with the environment throughout the seasons to control the house's climate. The wood surfaces catch and harness the sun's rays to passively heat the house in the summer and remain covered in the winter as to insulate the home's walls, saving loads of money on heating and air conditioning bills. Some of the house's greatest features are the flexible and adaptable parts the can grow and adjust with daily or even long term needs. Giant sliding walls separate the main living spaces. This separation allows for a private library, living room, or theatre when needed. Conversely, the spaces can be opened up and combined to create large entertaining, work, or play areas throughout the various rooms. Sideboards also move between the kitchen and the terrace, positioning the dining area outside on nice warm days. The front facade of the home is incredibly unique in itself. Windows made of stainless steel mirror shutters not only ventilate the the northern most rooms, but also make the street-side wall of the house a reflective piece of art. Each mirror window captures the nearby trees and passing cars, creating an ever-changing face on the front of the house that also serves as a unique camouflage behind the trees. The most important aspect of the home's sustainability is it's construction. Completely prefabricated offsite and delivered to the block, the simple procedure greatly reduced the potential pollution and noise for the sleepy suburban neighborhood. Finnish larch is known for its super durable and waterproof qualities as well as its smooth and knot-free surface, making it one of the most sought after materials for yachts and other small boats. This particular wood was sourced from small private forests dedicated to sustainable management and responsible growth. The pre-cut larch panels for the outside of the house get even more green points for including wood fiber insulation and non-treated siding. This super combo not only helps with the passive heating and cooling of the home, but also gives the house a unique appearance as the wood changes throughout the years.